Meet our Guys and Dolls! CHAE CLEARWOOD (General Cartwright) is so excited to return to the Arizona Broadway stage! She most recently performed at ABT as Rosie in Mamma Mia! and was also seen in Mary Poppins, Titanic, and Bridges of Madison County. A few of her other favorite credits include Dyanne in Million Dollar Quartet, Adelaide in Guys and Dolls, Rizzo in Grease, and Dolly in One Man, Two Guvnors. Chae recently graduated from the American Musical and Dramatic Academy (AMDA) in New York City and also holds a BA in Theatre Arts from Montana State University – Billings. Chae would like to thank the numerous friends and family who have supported her dreams and ambitions over the years, without which none of this would be possible. CHRISTOPHER CODY COOLEY (Harry the Horse) is excited to back at ABT! He was last seen in American in Paris. He holds a BA in Acting from Rider University. Past credits: Show Boat, Grease (Prather Productions); Crazy For You, Mamma Mia (Post Playhouse); Shrek The Musical, 42nd Street, The Fantasticks (Forestburgh Playhouse); Cole (St. Vincent Summer Theatre); The Wizard of Oz, White Christmas (Toby’s Dinner Theatre); Our Town, Metamorphoses (Rider University). Check his music out on Spotify or iTunes and follow @playitcooley on Instagram! Love to friends and family for their support! CHRISTIE DABREAU (Mimi/Miss Adelaide u/s) is ecstatic to be making her debut at Arizona Broadway Theatre. Guys and Dolls was the first musical she ever did, and she is thrilled to return to it again! Other past shows include Kiss Me, Kate (Lois Lane), Legally Blonde (Margot), My Way (Woman #2), Singin’ in the Rain (Kathy Seldon u/s), and Broadway’s recent Head Over Heels (OSF workshop)! Special thanks to my Mom, Dad, and Big Bud for the infinite love, support, and music. Shine bright, everyone! OLIN DAVIDSON (Lt. Brannigan) Back for his 4th ABT production, previous shows include Catch Me If You Can, Sweeney Todd, Titanic. Other credits include Seven Brides for Seven Brothers National Tour, Bert (Mary Poppins), Lumière (Beauty and the Beast), Scuttle (Little Mermaid), Henry Higgins (My Fair Lady), Andy Lee (42nd St); Les Mis, Ring of Fire, Nice Work, Forever Plaid, Shrek (PSST); Oklahoma, 42nd St., Pirates of Penzance, Cats, Hello Dolly! (Round Barn); Oklahoma, Pajama Game, 42nd St., Forever Plaid, Anything Goes (Prather Ent). He has been a dancer for Celebrity Cruise Lines and Debbie Gibson, and a vocalist for Barry Manilow. He was also a member of the Grammy-nominated Washington Chorus for their performance of the Berlioz Requiem. When not on stage he can be found playing keyboard in the pit of such shows as The Taffetas, Cats, Into the Woods, Next to Normal, and The Wizard of Oz. Thanks to his friends and family for all their support. TRISHA HART DITSWORTH (Sarah Brown) could not be happier to return to this wonderful theatre. Favorite credits: Maria (The Sound of Music), Mary Poppins (Mary Poppins), Fanny Brice (Funny Girl), Johanna (Sweeney Todd), Martha (The Secret Garden), Percy (The Spitfire Grill), Crissy (Hair), Penny (Hairspray), Pickles (Trailer Park), Annabel (Lucky Stiff), Sarah (The Toxic Avenger), Catherine (Pippin), Enid (Legally Blonde), Rapunzel (Into the Woods), Caroline (Titanic), Eden (Bullets Over Broadway), Lucinda (Ella Enchanted). She has a BFA in Musical Theatre from the University of Arizona and has lived and worked out of both New York and Chicago. She now resides in Phoenix and feels incredibly lucky to be part of such a lovely community of artists. She also enjoys spending time teaching voice lessons. For more information, message her at www.trishaditsworth.com. Thank you to Mom, Dad and Matravius for your endless love and support! BOB DOWNING (Big Jule) is thrilled to be back at ABT. After retiring from a 32-year sales career, Bob immediately pursed a lifelong desire to be on stage and has been involved in theatre ever since, appearing in two movies and one television show along with 35 stage productions. Bob was recently seen in A Bench in the Sun (Burt), produced by The Trilogy Players in The Encore Room at ABT. Other ABT credits include Best Little Whorehouse in Texas (Senator Wingwoah), Kiss Me, Kate (General Harrison Howell), Into the Woods (Cinderella’s Father), and The Odd Couple (Roy). He also appeared in Annie (The Butler), West Side Story (Officer Krupke), and Guys and Dolls (Big Jule) with Scottsdale Musical Theater Company. Bob thanks his wife Susan for her unwavering support and inspiration. TYLER PIRRUNG (Benny Southstreet) is so happy to be returning to ABT for his sixth show! BA in Theatre from Florida State University. Previous ABT Credits: Show Boat (Frank Schultz), Titanic (Benjamin Guggenheim), and the ensembles of Funny Girl and Oliver! Other recent credits: Singin’ in the Rain (Cosmo Brown), Young Frankenstein (Igor), The Drowsy Chaperone (Aldolpho), and A Christmas Carol (Christmas Past). He would like to thank his family, Charlie, and his friends for their endless love and support and also Kiel, Cass, and Kurtis for bringing him back out West! To see what else Tyler has done and to find out what adventures await him next, visit www.tylerpirrung.com! DANIEL STANLEY (Angie the Ox) is excited to be returning to ABT after recently performing in An American in Paris. Recent shows include Beauty and the Beast, Newsies, Tarzan, White Christmas, and Fiddler on the Roof. Daniel recently toured with Cirque Musica Wonderland as the associate choreographer. Thanks to his family, friends, and Lauren for the constant love and support. 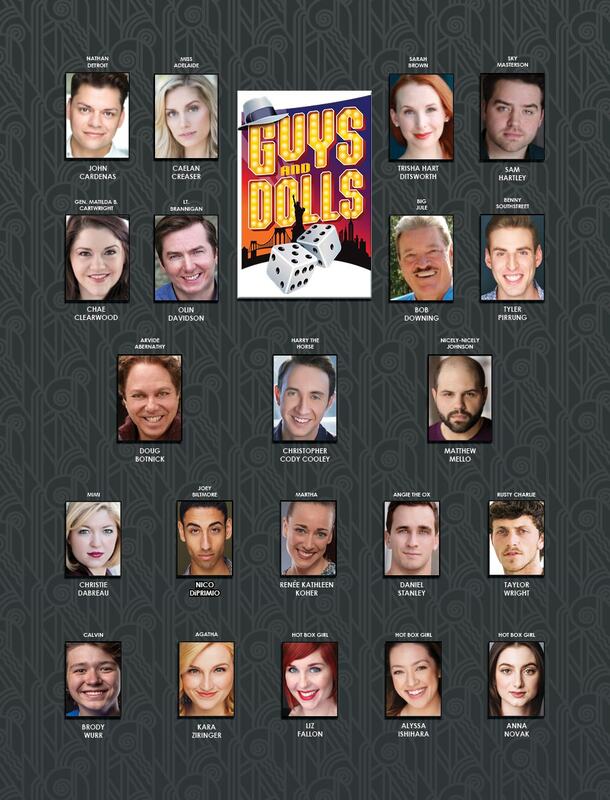 BRODY WURR (Calvin) is thrilled to be a part of Arizona Broadway Theatre’s amazing production of Guys and Dolls! It’s a dream come true! Brody was last seen on ABT’s stage as the Bellboy in Titanic: The Musical and as Andrew Jackson in Spotlight Youth Theatre’s production of Bloody Bloody Andrew Jackson. Brody also performs with ABT’s incredible performance group, Sonic Revolution. Thank you for coming to see the show and supporting the performing arts at Arizona Broadway Theatre! KARA ZIRINGER (Agatha/Sarah u/s) is thrilled to be returning to the ABT stage! NYC based, Florida State alumni. Some of her favorite ABT credits include An American in Paris (Ensemble), Mary Poppins (Ensemble/Mary u/s), Show Boat (Ensemble/Magnolia u/s), Sweeney Todd, and A Christmas Carol. Other favorite regional credits include A Chorus Line (Maggie) and Into the Woods (Rapunzel.) She would like to thank her family, friends, and the entire ABT team for their unwavering love and support. Visual and performing arts play a vital role in building a strong and vibrant community. Whether we’re making art, telling stories on the stage, or simply sharing in the experience, we all connect and are inspired by the arts. Arizona Broadway Theatre is delighted to partner with the City of Peoria, Peoria Fine Arts Association, West Valley Art Museum, and Celebration of the Artists 2019 to create a public art space to spotlight the work of local artists and art organizations. ABT welcomes the public to view the exhibition during Box Office hours. JASMINE BASSHAM (Ensemble/Sophie u/s) is ecstatic to make her Arizona Broadway Theatre debut! Her past credits include Mary Magdalene in Jesus Christ Superstar, Fraulein Kost in Cabaret, Heather in American Idiot, and Thea in Spring Awakening. Jasmine would like to thank her friends, family, and everyone at ABT for all of the love and support. Special thank you to her father, Robert Bassham. Without him, none of this would be possible. BLAIR BEASLEY (Ensemble/Rosie u/s) is very excited to be back at Arizona Broadway Theatre! She was previously in ABT’s production of Jesus Christ Superstar (Disciple), South Pacific (Bloody Mary u/s) and Show Boat (Stevedore Gal). Off-Broadway: Urinetown: The Musical (Revival) (Little Becky Two Shoes, American Theatre of Actors). Regional: The Hunchback of Notre Dame (Madame/Congregation, The Ogunquit Playhouse), South Pacific (Bloody Mary u/s, Drury Lane Theatre), Footloose (Wendy Jo, Eldorado Resort Casino). Other credits include RENT (Seasons of Love Soloist), The Wedding Singer (Holly). BFA Acting from Syracuse University. She would like to thank her family, close friends and her Nana for their limitless love and support. ALEXANDRA CARTER (Sophie Sheridan) is so excited to be a part of this beloved show here at ABT. She was last seen here in Fiddler On The Roof (Chava) and is thrilled to be back. She recently performed in the world premiere of Ciao Bambino the Musical in addition to starring in America’s Favorite Newscaster, a new musical produced by Theater for the New City. Alexandra was also a lead vocalist on Viking Ocean Cruises. Some of her other credits include Carrie (Frieda) at the Westchester Sandbox Theater and the National Tour of Miss Nelson is Missing (Allison) with Theaterworks USA. Alexandra received a BA in musical theater from Marymount Manhattan College. CHAE CLEARWOOD (Rosie) is so excited to return to the ABT stage! She was most recently seen as Mrs. Brill/Bird Woman in Mary Poppins and The Bridges of Madison County. A few of her other favorite credits include Dyanne in Million Dollar Quartet, Adelaide in Guys and Dolls, Rizzo in Grease, and Dolly in One Man, Two Guvnors. Chae recently graduated from the American Musical and Dramatic Academy (AMDA) in New York City and also holds a BA in Theatre Arts from Montana State University – Billings. Chae would like to thank the numerous friends and family who have supported her dreams and ambitions over the years, without which none of this would be possible. LYNZEE FOREMAN (Ensemble/Tanya u/s) is thrilled to be back on the ABT stage in such an amazing show with even more amazing people! Lynzee was last seen at The Phoenix Theatre Company as Loraine in Jersey Boys and as herself in GODSPELL and prior to that at Arizona Broadway Theatre in HAIR as Jeanie. Some of her favorite roles include Lina Lamont in Singin’ in the Rain, Pippi in Trailer Park The Musical (both at ABT) as well as Daniela in In The Heights at Phoenix Theatre. When not performing, she is blessed to work with the Valleys best youth talent at ABT in the HyRev Program and somehow finds time to ride her reining horses! The MOST love to her family and her hubby, Mark and baby girl Shiloh. This one is for you Den. JACOB HERRERA (Pepper) is thrilled to be back on the Arizona Broadway Theatre’s stage for Mamma Mia! Previously at ABT, Jacob has been seen in Saturday Night Fever (Ensemble), Altar Boyz (Luke and Juan swing), Titanic (Officer Lightoller), Miracle On 34th Street (Ensemble/Bailiff), and the TYA Princess and the Pea (Prince Eric). He was also a part of the 2018 season at Fort Peck Summer Theatre. He is honored to have the opportunity of spreading his love for musical theatre to audiences around the Valley, and thanks you for supporting live theatre. Jacob would like to thank Kiel, Cassandra, and Kurtis; his family, friends, his Fort Peck family, the 4Mans, and everyone here at ABT. Enjoy the show! NICHOLAS KUHN (Sky) is absolutely thrilled to be returning to Arizona Broadway Theatre! Past ABT credits include Camelot (Sir Lionel), A Christmas Carol (Fred), The Best Little Whorehouse in Texas (Aggie), Hair (Tribe member), and The Little Mermaid (Ensemble/Eric u/s) just to name a few. His New York credits include Thoroughly Modern Millie (Trevor Graydon), Whoopee (Ensemble), America’s Sweetheart (Ensemble), The Bully (Steve). Other favorite credits are The Fantasticks (Matt) and Godspell (Jeffery Track) (Artistree Music Theatre Festival). Nick would like to thank ABT for the opportunity, and his amazing friends and family for their never-ending support! Kabocha! JESSICA MEDOFF (Tanya) is breaking down barriers, showing her multi-dimensional talents and emotional depth as an actress of stage and screen. Recent engagements include Aldonza/Dulcinea in Man of La Mancha with Arizona Broadway Theatre, Mayor/Ma Ferd in The Toxic Avenger with Farmers Alley Theatre, and Mayzie in Seussical: The Musical and Heidi in [title of show] at The Roxy Theater. On screen, Jessica has appeared in The Heart Outright and co-starred with Edward James Olmos and George Lopez in Walking with Herb. ANDY MEYERS (Bill Austin) most recently appeared as Radioman Bride in Titanic. Other recent projects include Bud in The Bridges of Madison County, Sancho in Man of La Mancha, Jean Shepherd (Narrator) in Christmas Story, Enoch Snow in Carousel and King Herod in Jesus Christ Superstar, as well as directing South Pacific, The King and I, Oliver, The Best Little Whorehouse in Texas, The Secret Garden, and Seven Brides for Seven Brothers, among many others. He is currently in his 8th year as Artistic Director of Fort Peck Summer Theatre, where he had led the company to recording breaking seasons, and was previously Managing Director for Performing Arts at Snug Harbor Cultural Center, Staten Island, NY. Other favorite performance credits include the national tours of Annie and Bus Stop. Andy is a graduate of Walnut Hill School for the Arts in Boston, Wagner College in NYC and holds his Masters from the University of Montana. This holiday season at ABT, he will also be directing Charlie Brown Christmas! BRIAN ASHTON MILLER (Harry Bright) Originally from Charleston, WV, Brian is more than grooved to make his ABT debut! National Tours include RENT (Roger), Rock of Ages (Dennis) and Grease! (Roger). Other credits include Debbie Does… opposite Adam Lambert, Rock of Ages (Dennis at the Palace NH), and The Great American Trailer Park Musical (Norbert) at LTOTS. Film: Across the Universe, The Good Shepherd. A Marshall University grad with a degree in Marketing, he dedicates every performance to his amazing, supportive family! Country Roads to the Greek Islands…here I go! JABRIEL SHELTON (Eddie) is so excited to be a part of this show! Some favorite past shows include RENT (Angel), Hairspray (Seaweed), Les Misérables (Marius), Gator (Memphis), and Sweaty Eddie in Sister Act. He was last seen at the Palace Theatre in Secret Garden as Fakir. He has performed on Norwegian Cruise Line as a production singer, has done a national tour, and has worked around the world in several professional theatres. Lastly, he hopes everyone sits back, relaxes, and enjoys the show! BRENDAN TRYBUS (Ensemble/Sky u/s) is thrilled to be a part of the Arizona Broadway Theatre’s season! He is a recent graduate of Bucknell University, where some of his favorite roles include Bobby Child in Crazy for You, Melchior Gabor in Spring Awakening, Gabe Goodman in Next to Normal, and Enoch Snow in Carousel. Regional: Hairspray (IQ), West Side Story (Big Deal), Gypsy (Georgie), Seussical (Vlad Vladikoff), The Drowsy Chaperone (Ensemble). DYLLAN VALLIER (Ensemble) is thrilled to be making his Arizona Broadway Theatre debut! Some of his favorite credits include The Producers, Broward Stage Door Theatre; La Cage aux Folles, Ivoryton Playhouse, Broward Stage Door Theatre, Axelrod Performing Arts Center; Damn Yankees, Footloose, Tibbits Opera House; A Chorus Line, Playhouse on Park; Only Anne, Goodspeed Opera House. He holds a BFA in Musical Theatre from the Hartt School. Much love to Mom, Dad, Matt, and Louie. BRODY WURR (Ensemble) is thrilled to be part of this amazing production of Mamma Mia! Brody most recently was seen on the Arizona Broadway Theatre stage in the beautiful Titanic: The Musical and in Spotlight Youth Theatre’s rocking production of Bloody Bloody Andrew Jackson. Brody is the proud recipient of the 2016 National Youth Arts Award for Junior Artist of the Year. Thank you for coming to see the show, and thank you to ABT for making dreams come true! LAUREN ALAGNA (Ensemble) A Florida native, Lauren is thrilled to be returning to Arizona Broadway Theatre for this production of An American in Paris. Past credits include Catch Me If You Can (ABT), Spamalot, Newsies, Mamma Mia, Tarzan, Crazy for You (Polly Baker), and sailing the high seas with Holland America Line. Many thanks to Kurtis, Cass, Kyle, and the entire ABT team for this opportunity, and to her family and Daniel for their constant love and support. EMMA BARTOLOMUCCI (Ensemble) has choreographed musical theatre and children’s touring theatre, as well as music videos for Splash n’ Boots and with production company Yeah! Films. She has taught with several different companies including Ryerson School of Performance. Her work with the bold indie theatre company, Echo Productions, has given her the chance to choreograph stories like Bonnie and Clyde, Dr. Jekyll and Mr. Hyde and Charles Manson: Son of Man. She has performed all across Canada, the United States and Europe in Hair. She worked with Norwegian Cruise Lines as a Singer/Dancer sailing Central and South America. This past October, she launched her company, Dance Fachin, with their premiere debut, Worldly Women. With lots of experience in dance and a great foundation in music and storytelling, she believes that this is her formula for creation. Very happy to be performing at ABT! Let’s go! MATTHEW BLUM (Mr. Z) is so excited to be a part of this brilliant show and this wonderful company. Recent credits include Tour: Wizard of Oz (asst. dance captain, swing); Regional: Holiday Inn (ensemble), A Chorus Line (Al), Kiss Me, Kate (Bill Calhoun). Thanks to my parents for all their support. Enjoy the show! CHRISTOPHER CODY COOLEY (M. Baurel) is excited to back at ABT! He was last seen in Titanic the Musical. He holds a BA in Acting from Rider University: Westminster College of the Arts. Past credits: Show Boat, Grease (Prather Productions); Crazy for You, Mamma Mia (Post Playhouse); Shrek The Musical, 42nd Street, The Fantasticks (Forestburgh Playhouse); Cole (St. Vincent Summer Theatre); The Wizard of Oz, White Christmas (Toby’s Dinner Theatre); Our Town, Metamorphoses (Rider University). Love to friends and family for their support! BEATRICE CROSBIE (Milo Davenport) is overjoyed to return to Arizona Broadway Theatre! NYC based, UCLA alumni. Tours: Beauty and the Beast International (Wardrobe/Mrs. Potts us), 42nd Street National (Diane/Dorothy Brock us), How the Grinch Stole Christmas, The Musical National (Grandma Who). Regional: Mary Poppins (Mrs. Banks), Nice Work If You Can Get It (Billie), She Loves Me (Amalia). Big thanks to the ABT team and love to my incredible family! EVAN DOLAN (Ensemble/Jerry Alternate) is delighted to miss yet another winter to perform in sunny Arizona in both Miracle on 34th Street and An American in Paris! Some of his favorite credits include the Jeff Award-winning production of Sweeney Todd (Paramount Theatre), Disney’s Mary Poppins & Funny Girl (Arizona Broadway), Cabaret (Thingamajig Theatre Co.), West Side Story (Woodstock Playhouse), Nice Work If You Can Get It (Broward Stage Door), Kiss Me, Kate (Alhambra Theatre). He sends a massive “THANK YOU” to his family for supporting him in all of his adventures and everyone at ABT for their continued generosity! JAMES Du CHATEAU (Ensemble) started his career with the Radio City Christmas Spectacular in Nashville, Tenn. He made his Broadway debut in How the Grinch Stole Christmas as Danny Who. Recent credits: Catch Me If You Can (Arizona Broadway Theatre); Assistant Dance Captain, Saturday Night Fever; Dancer, Grand Celebration Cruise; Hanna, La Cage Aux Folles; Tommy Djilas, The Music Man; Ensemble, Mamma Mia; Ensemble, 42nd Street. James is excited to perform here at ABT! ALYSSA ISHIHARA (Ensemble) is thrilled to be making her ABT debut! Recent credits include West Side Story; The Music Man; I Love You, You’re Perfect, Now Change; and Mary Poppins. Graduate of The American Musical and Dramatic Academy’s Dance Theatre program in New York. Big thanks to the ABT team, Mom and Dad, and my mentors for the love and support! CAROLYN McPHEE (Mme. Baurel) is excited to be back on the ABT stage! Carolyn has been kept busy by ABT, most recently with the Encore Room premiere production of Forbidden Broadway. Recent ABT Mainstage favorites include Titanic (Ida Strauss), Catch Me If You Can (Paula), Bridges of Madison County (Marge), Hands on a Hardbody (Virginia), A Christmas Story (Mother), and The Great American Trailer Park Musical (Linoleum). Originally from Chicago, Carolyn attended NIU and appeared throughout Chicago including Drury Lane, Apollo Theatre, Apple Tree, Theatre at The Center, Light Opera Works, Borealis and Pheasant Run Dinner Theatre. Carolyn and her husband foster kittens and help rehome found pets. Carolyn donates her entire salary to help with spay/neuter/dental costs of cats and dogs for people who cannot afford it. MICHAEL O’BRIEN (Adam Hochberg) is thrilled to return to ABT for this very special production. Previous credits at ABT include Sweeney Todd (at Herberger Theater Center), Les Mis, Carousel, The Man of La Mancha, and A Christmas Carol. He holds a BFA in Musical Theatre from The Hartt School of Music and has been seen around the country in various regional productions. When he is not on stage, he is a successful real estate agent in NYC. A very special thank you to his mom & dad, Cass, Kurtis, Kiel, Rob, and the entire ABT family! LAUREN PALEY (Ensemble/Lise Alternate) is overwhelmed with gratitude to be back on the ABT stage for An American In Paris, a dream show! Last seen here as Ellie in Show Boat, she has also been a part of ABT’s A Christmas Carol, Beauty and the Beast, Oliver, and Funny Girl. Other favorite credits include Ariel in The Little Mermaid, Ado Annie in Oklahoma, and performing in the ensembles of White Christmas, Carousel, and Thoroughly Modern Millie. She’s eternally grateful to Cassandra and Kiel, and a very special thank you to Kurtis for this opportunity to dance his brilliant choreography. Thanks and big love to her teachers, family, and Will for their unwavering support. MEGAN SCHWARTZ (Ensemble) is absolutely thrilled to make her Arizona Broadway Theatre debut! Favorite regional credits include: Spamalot, Mamma Mia, 42nd Street, Oliver, Cats, Grease, Jesus Christ Superstar, Evita, Legally Blonde, Brigadoon, Hairspray, Oklahoma, In the Heights & dance captain for Norwegian Cruise Line. Point Park University graduate. Much love & many thanks to my amazing family. REBECCA SHULLA (Lise Dassin) is thrilled to be making her Arizona Broadway Theatre debut! A proud graduate of the University of Arizona’s School of Dance, Rebecca’s favorite performance credits include Disney Cruise Line, Spirit Production’s Christmas Wonderland, and The Great American Dance Tour of China with Artifact Dance Project. Rebecca would like to thank her family and friends for their endless love and support, all of her teachers for their wisdom and guidance, and God for this enormous blessing. DANIEL STANLEY (Ensemble) is thrilled to be performing at Arizona Broadway Theatre. Recent shows include Beauty and the Beast, Newsies, Tarzan, White Christmas, and Fiddler on the Roof. Daniel recently toured with Cirque Musica Wonderland as the associate choreographer. Thanks to his family, friends, and Lauren for the constant love and support. EMILY STYS (Ensemble) is extremely excited to be making her Arizona Broadway debut! She recently performed in the Palace’s production of Spamalot in Manchester, NH. Emily has spent many years working for Disney Cruise line and Tokyo Disneyland singing with her “princess friends.” She was a part of the opening cast for the new imagined Beauty and the Beast. All the love to my family back in Michigan for their unending support. LAURIE TRYGG (Ensemble) is very happy to return to Arizona Broadway Theatre! Some of her favorite ABT credits include A Christmas Carol (Ghost of Christmas Future), Cats (Cassandra), Legally Blonde (Elle’s Mom/Judge), A Chorus Line (Sheila), Joseph and the Amazing… (Potiphar’s Wife), and The Odd Couple (Gwendolyn Pigeon). Other regional credits: Avenue Q (Bad Idea Bear/Mrs. T), Elf: The Musical, Billy Elliot, Bullets Over Broadway, Chicago (Annie), Pippin (Aerialist/Player), White Christmas (Rhoda), Nine (Maria), Evita and Mary Poppins. KARA ZIRINGER (Ensemble) graduated from Florida State University in May of 2016 and has been living in New York City ever since. Her previous ABT credits include Miracle on 34th Street (Clara/Ense. ), Mary Poppins (Ensemble/ Mary Cover), Show Boat (Ensemble/Magnolia Cover), Sweeney Todd (Ensemble), and A Christmas Carol (Ensemble.) Other favorite credits include A Chorus Line (Maggie), Into the Woods (Rapunzel), and Legally Blonde (Serena.) She would like to thank her family and friends for their unwavering love and support. Enjoy the show! KATERINA ANDERSON (Hendrika) is 10 years old and thrilled to make her ABT debut in this holiday classic! Katerina’s love for the stage began as a dance student at the age of 5 and quickly evolved into a passion for musical theater. Katerina’s past performances include Peter Pan in Shrek the Musical, July in Annie, Charlie Bucket in Willy Wonka, Jr., and Ludmilla in Hamlet: A Tragedy in Three Rings. Katerina thanks everyone at ABT for this amazing opportunity and her family for their love and support! MEREDITH ARENDS (Girl) a fifth-grade student at Arizona School for the Arts, is happy to be making her ABT debut. She was last seen as an orphan in Valley Youth Theatre’s production of Annie at the Herberger. When not on the stage, Meredith enjoys dancing, writing songs, and playing the flute. TONY BLOSSER (R.H. Macy) is ecstatic to be returning to the ABT stage after a brief hiatus. He recently could be found backpacking through the Himalayas or spelunking the Waitomo Glowworm Cave in New Zealand, and, after reading Astral Projection For Dummies, he was able to do all this while binge watching Netflix from the comfort of home. Tony is a proud new member of the Equity Membership Candidate Program. Thank you, dear patron, for spending your Holiday Season with us! I usually order the chicken. #teamthrilled. MJJ CASHMAN (Kris Kringle) is happy to be invited to return & repeat one of his favorite roles at one of his favorite venues. He’s especially eager to help introduce a new generation of young audiences to live theatre. Thanks to life upon the wicked stage, MJJ has traveled to all contiguous lower 48 states & performed in all but 3: NV & both Dakotas. Besides Kris, ABT audiences may remember him as Mr. Mushnick, Colonel Pickering, RF Simpson & Prof Porter. Since his last appearance here he has received one knee & two full hip replacements, but, as you’re likely to notice but too polite to mention, has the same two left feet. CHAE CLEARWOOD (Miss Simms/Mrs. Beeler) is so excited to return to the ABT stage! She was most recently seen as Charlotte Cardoza in Titanic, Mrs. Brill/Bird Woman in Mary Poppins, and The Bridges of Madison County. A few of her other favorite credits include Dyanne in Million Dollar Quartet, Adelaide in Guys and Dolls, Rizzo in Grease, and Dolly in One Man, Two Guvnors. Chae recently graduated from the American Musical and Dramatic Academy in New York City and also holds a BA in Theatre Arts from Montana State University, Billings. Chae would like to thank the numerous friends and family who have supported her dreams and ambitions over the years, without which none of this would be possible. JULIANNE CREED (Hendrika) is in 7th grade and loves to perform. Last summer was a dream when she performed as Jane Banks in ABT’s Mary Poppins! Her past performances include Young Fiona in NCS’s production of Shrek, Jr., Young Wilbur in Charlotte’s Web, and Gracie Shinn in The Music Man. She has performed as Cinderella in Cinderella and as part of the Ensemble in White Christmas for Pinnacle Creative Arts. She loves gymnastics, family and friends, singing, and being creative/crafty! She’s thankful to be part of the ABT family! EVAN DOLAN (Mailman) is delighted to miss yet another winter to perform in sunny Arizona in both Miracle on 34th Street and An American in Paris! Some of his favorite credits include the Jeff Award-winning production of Sweeney Todd (Paramount Theatre), Disney’s Mary Poppins & Funny Girl (Arizona Broadway), Cabaret (Thingamajig Theatre Co.), West Side Story (Woodstock Playhouse), Nice Work If You Can Get It (Broward Stage Door), and Kiss Me, Kate (Alhambra Theatre). He sends a massive “THANK YOU” to his family for supporting him in all of his adventures and everyone at ABT for their continued generosity! FRED GERLE (Judge/Mayor) Arizona Broadway Theatre’s holiday production of Miracle on 34th Street is Fred’s fourth appearance here. He enjoyed his roles in Carousel in 2016 (Starkeeper/Dr. Seldon), in 2017’s Oliver! (Mr. Browlow), and, most recently, as Isidor Straus in Titanic, The Musical. In the past year, he was also seen in the Phoenix area in West Side Story (Lt. Schrank, Scottsdale Musical Theater Company) and A Christmas Carol (Jacob Marley/Old Joe, TheaterWorks). He is currently providing one of the character voices for the soon-to-becompleted web series Benefactors. Special thanks go out to Kiel, Cassandra, and Kurtis for this wonderful opportunity and to his beautiful, supportive wife, Kerry! PHILLIP GIANDILETTI (Climber/ Watchman) is a recent graduate of Oklahoma City University as a Dance Performance major and is excited to be returning to ABT! He was recently a performer in Mary Poppins at ABT as Neleus/Ensemble. Originally from New Jersey, Phillip lived in Chandler, Arizona, for 4 years and is so glad to be back again for the Holidays. Other theatre credits include Danny Zuko in Grease (The Firehouse Theatre), Evita (Casa MaЦana Theatre), Al Deluca in A Chorus Line (Uptown Players), Newsies (Oscar Delancey/Ensemble/Dance Captain), 7 Brides for 7 Brothers (Nathan); Music Theatre Wichita, West Side Story (Lyric Theatre of Oklahoma), and 42nd St. (The Lexington Theatre Company). JACOB HERRERA (Bailiff) has a passion for musical theater and is very grateful for the opportunity to share his love for the arts with audiences. Previously at ABT he was in Saturday Night Fever, the Juan/Luke swing in Altar Boyz, Officer Lightoller in Titanic, and has assisted in the ABT Academy summer camps. He recently spent the summer at Fort Peck Summer Theater. Locally, Jacob has also been seen in his NYA award-winning and ariZoni nominated role of Joseph in Joseph…Dreamcoat at Desert Stages and Warner in Legally Blonde at Spotlight Youth Theater. Jacob would like to thank the Foremans, Andy Meyers and the Fort Peck family, the ABT family, his friends Bryce and Samantha, and all of the others who have supported him along the way. Enjoy the show and happy holidays! CYRUS HILDING (Tommy) is ecstatic to return the Arizona Broadway Theatre’s stage for Miracle on 34th St. Cyrus is 11 and a sixth grader at Arizona Conservatory for Arts and Academics. Some of his favorite recent roles include Chi Fu (Mulan Jr.) and Mike TeaVee (Willy Wonka Jr.) at SYT, and Randy (A Christmas Story) and Workhouse Boy (Oliver) at ABT. He is a Nerf, Star Wars, and Lego enthusiast who loves playing the saxophone and tinkering with electronics. Cyrus would like to give an enormous, heartfelt thank you to Cassandra, Kiel, Rob, Kurtis, and everyone at ABT for this amazing opportunity! JOHN KNISPEL (D.A.) is so humbled to be returning to Arizona Broadway Theatre for his 2nd season! After performing in Man of La Mancha, A Christmas Carol, Show Boat, and Hair last season, he knew he’d have to do what he could to come back to this winter paradise! Favorite past credits include Emcee in Cabaret, Elvis Presley in Million Dollar Quartet, Ritchie Valens in Buddy: The Buddy Holly Story, Lord Farquaad in Shrek: The Musical, and Princeton in Avenue Q. A Billings, Montana, native, John graduated from the University of Montana with degrees in Vocal Performance and Music Education. John would like to give a huge thank you to his family, Paul, Berta, Jessica, and Anica for being so supportive over the years. NICK KUHN (Alvin) is absolutely thrilled to be returning to Arizona Broadway Theatre! Past ABT credits include Camelot (Sir Lionel), A Christmas Carol (Fred), The Best Little Whorehouse in Texas (Aggie), Hair (Tribe member), and The Little Mermaid (Ensemble/Eric u/s), just to name a few. His New York credits include Thoroughly Modern Millie (Trevor Graydon), Whoopee (Ensemble), America’s Sweetheart (Ensemble), and The Bully (Steve). Other favorite credits are The Fantasticks (Matt) and Godspell (Jeffery Track) at Artistree Music Theatre Festival. Nick would like to thank ABT for the opportunity and his amazing friends and family for their never-ending support! Kabocha! SAM LAWRENCE (Harry) is excited to be making his debut performance on the ABT stage as Harry Finfer. He lives in Surprise, Arizona, with his family and is currently in the 5th grade. Last spring, Sam performed as Charlie Bucket in Theatre Works’ Kid’s Alive performance of Willy Wonka Jr. When not pursuing piano, voice, and theatre, Sam likes to play soccer, draw cartoons, create origami, and travel. Sam would like to thank his directors and teachers (former and present) and his family for their support and encouragement. AARON McCASKILL (Harry) is a 7th grader and is home-schooled. He has performed in over 29 musical theater productions. His favorite roles have been Michael Banks in Mary Poppins at Arizona Broadway Theatre, Ching Ho in Thoroughly Modern Millie Jr., Dennis in All Shook Up, and Kevin in Robin Hood and his Merry Men at Actors Youth Theater, and Piglet in A Winnie the Pooh Christmas Tale at Valley Youth Theater. When Aaron isn’t on stage he enjoys playing piano, writing his own songs, cooking, singing, and dancing. He’s excited to be back at ABT for another production. DREA METZGER (Girl) is overjoyed to share ABT’s stage with Actors/Crew she admires! Drea loves singing, ballet, and baking. Favorite roles are Shprintze (Fiddler on The Roof) and Young Fan (Christmas Carol) at ABT; Flounder (The Little Mermaid) at BPA; and Duffy (Annie) and Baby June (Gypsy) at DFT. Drea thanks her family for their support! Special thanks to Cassandra Klaphake & Kurtis Overby for their guidance and this amazing opportunity, Renée Koher for her encouragement and insight, and Jacqueline Dunford for inspiring her. ANDY MEYERS (Shellhammer) just appeared as Radioman Bride in Titanic and can’t imagine spending the holidays anyway other than at ABT, where other recent projects include Bud in The Bridges of Madison County, Sancho in Man of La Mancha, Jean Shepherd (Narrator) in Christmas Story, Enoch Snow in Carousel, and King Herod in Jesus Christ Superstar, as well as directing South Pacific, The King and I, Oliver, The Best Little Whorehouse in Texas, The Secret Garden, and Seven Brides for Seven Brothers, among many others. He is currently in his 8th year as artistic director of Fort Peck Summer Theatre, where he had led the company to recording breaking seasons, and was previously managing director for Performing Arts at Snug Harbor Cultural Center, Staten Island, NY. Other favorite performance credits include the national tours of Annie and Bus Stop. Andy is a graduate of Walnut Hill School for the Arts in Boston, Wagner College in NYC and holds his Masters from University of Montana. This holiday season at ABT, he will also be directing Charlie Brown Christmas! AVA NEWTON (Susan), 10, is excited to be back on stage at Arizona Broadway Theatre for this heartwarming holiday classic. She is in the fifth grade at Montessori Kingdom of Learning. She was most recently seen at TheaterWorks in The Little Mermaid (Flounder) and The Lion, The Witch and The Wardrobe (Lucy). She is so thankful for this opportunity and wants to thank Cassandra, Kurtis, and Rob. She would also like to thank her family and friends for all their support. JAY ROBERTS (Mr. Sawyer) is incredibly excited to be back in Arizona! Previous ABT credits: Edgar Beane in Titanic, Old Joe in A Christmas Carol, Mr. Sowerberry in Oliver, and Schroeder in Charlie Brown Christmas. Jay is finally applying his degree in architecture, designing a historical wing for the Pioneer Museum in Glasgow, Montana, and has been scenic designer for several shows at Fort Peck Summer Theatre. A few of his previous roles include Arthur Kipps in The Woman in Black, the Jeff Barry in Leader of the Pack, and Prince Eric in Disney’s The Little Mermaid at the Fort Peck Summer Theatre. Jay is overjoyed to be returning to the ABT family. Thank you to Cass and Kurtis for this amazing opportunity. TIM SHAWVER (Mr. Gimbel/Tammany O’Halloran) is overjoyed to spend the holidays at ABT! He’s previous appeared at ABT in Disney’s The Little Mermaid, Funny Girl, Church Basement Ladies, Lucky Stiff, and It’s a Wonderful Life: the Radio Play, as well as directed ABT’s Theatre for Young Audience productions of Charlotte’s Web and Junie B. Jones: the Musical. His favorite acting credits include work at Phoenix Theatre (Bloody Bloody Andrew Jackson), Childsplay (Busytown, Junie B. Jones), Actors Theatre (The Lieutenant of Inishmore), Southwest Shakespeare Company, and Stray Cat Theatre. Tim is a co-founder of A/C Theatre Company where he serves as Director of Artistic Operations, and he’s a third generation Phoenix native. MEGGIE SIEGRIST (Girl Scout) was last seen on the ABT stage in their productions of Titanic and Hair. Other credits include Ursula in The Little Mermaid (Fort Peck Summer Theater), Mrs. Banks in Mary Poppins (Jenny Wiley Theater), The Housekeeper in Man of La Mancha (ABT), Ellie Greenwich in Leader of the Pack (Fort Peck Summer Theater), and Audrey in Leading Ladies (The Great American Melodrama). She would like to give a huge shout out to her entire ABT family for making Arizona the best home away from home a girl could ask for. CREEDENCE WEISBERG (Tommy) has loved performing from a young age, and he says he is “born to be on Broadway.” Creed is thrilled to be performing and has done local theater in the Lion King Jr and was Pinocchio in Shrek the Musical Jr. When he is not singing or directing shows with his friends, Creed enjoys the life of a 9-year-old playing video games and being with his friends and family. KARA ZIRINGER (Dutch Girl’s Mother/ Clara) is thrilled to be spending her second holiday season with ABT! She graduated from the Florida State University in May of 2016 and has been living in New York City ever since. Her previous ABT credits include Mary Poppins (Ensemble/Mary Cover), Show Boat (Ensemble/Magnolia Cover), Sweeney Todd (Ensemble) and A Christmas Carol (Ensemble.) Other favorite credits include A Chorus Line (Maggie), Into the Woods (Rapunzel), and Legally Blonde (Serena.) She would like to thank her family and friends for their unwavering love and support. Enjoy the show! CHAE CLEARWOOD (Charlotte Cardoza) is so excited to return to the ABT stage! She was most recently seen as Mrs. Brill/Bird Woman in Mary Poppins and The Bridges of Madison County. A few of her other favorite credits include Dyanne in Million Dollar Quartet, Adelaide in Guys and Dolls, Rizzo in Grease, and Dolly in One Man, Two Guvnors. Chae recently graduated from the American Musical and Dramatic Academy in New York City and also holds a BA in Theatre Arts from Montana State University ’96 Billings. Chae would like to thank the numerous friends and family who have supported her dreams and ambitions over the years, without which none of this would be possible. CHRISTOPHER CODY COOLEY (J.J. Astor) is excited to be back once again at ABT! He was last seen in Catch Me If You Can. He holds a BA in Acting from Rider University: Westminster College of the Arts. Past credits: Show Boat, Grease (Prather Productions) Crazy For You, Mamma Mia (Post Playhouse), Shrek The Musical, 42nd Street, The Fantasticks (Forestburgh Playhouse); Cole (St. Vincent Summer Theatre) The Wizard of Oz, White Christmas (Toby’s Dinner Theatre) Our Town, Metamorphoses (Rider University). Love to friends and family for their support! MATTHEW CURTIS (First Officer Murdoch) is thrilled to return to ABT. Past roles include Bishop/Javert u/s (Les Misérables), Valentine (Kiss of the Spider Woman), Kevin (In The Heights), The Engineer (Miss Saigon), Paul (Company), Jud (Oklahoma! ), Gus (Cats), Capt. Walker (Tommy), Darren (Take Me Out), Albert Lenox (Secret Garden – ABT). He has been trained under the watchful eyes of Broadway stars Marc Kudisch, Robert DuSold, Jeff McCarthy, and Patrick Page. Thank you, Kurtis and Cassandra! Please visit www.matthewjohncurtis.com for more info. This one is for my Uncle Tony!!! OLIN DAVIDSON (Captain E.J. Smith) is thrilled to be joining ABT for another production. Credits include My Fair Lady (Henry Higgins), Mary Poppins (Bert), Beauty and the Beast (Lumière), The Little Mermaid (Scuttle), Oklahoma! (Will Parker), Cats (Skimbleshanks), Mamma Mia! (Harry), Forever Plaid (Smudge). He has also performed with Debbie Gibson as a backup dancer and with Barry Manilow as a vocalist. Many thanks to my loving family for their never-ending love and support, as well as the team here at Arizona Broadway for this opportunity. FRED GERLE (Isidor Strauss) Arizona Broadway Theatre’s outstanding production of Titanic is Fred’s third appearance here. He enjoyed his role in Carousel in 2016 (Starkeeper/Dr. Seldon) and in 2017’s Oliver! (Mr. Browlow). In the past year, he has also been seen in the Phoenix area in West Side Story (Lt.Schrank) and A Christmas Carol (Jacob Marley/Old Joe). He is currently providing one of the character voices for a soon-to-be-completed web series Benefactors. Special thanks go out to Kiel, Cassandra, and Kurtis for this wonderful opportunity and to his beautiful, supportive wife, Kerry! DAVID GROCCIA (John B. Thayer) ABT debut! Regional: Ocean State Theatre Company, Millbrook Playhouse, Jenny Wiley Theatre, Jean’s Playhouse, Greater Ocean City Theatre Company, Priscilla Beach Theatre, and Reagle Music Theatre. National Tour: ArtsPower National Touring Theatre. David is originally from Rhode Island and a graduate of Rhode Island College. For Mom, watching from the best seat in the house. JACOB HERRERA (Second Officer Lightoller) studied Music Education at GCC and has a passion for musical theater and is very grateful of the opportunity to share his love for the arts with audiences. Previously at ABT he was seen in Altar Boyz (Swing Juan/Luke) and Saturday Night Fever (Ensemble) and has assisted in the ABT Academy summer camps. His most recent credits are Hans in Cabaret, Christopher in Leader of The Pack, and Jetsam in The Little Mermaid, all at Fort Peck Summer Theater in Montana. Locally, he was recently seen as Joseph in Joseph and the Amazing Technicolor Dreamcoat at Desert Stages and Warner in Legally Blonde at Spotlight Youth Theater. Jacob would like to thank the 4Mans, the ABT family, his friends Bryce and Samantha, and all of the others who have supported him along the way. Enjoy the show! KIEL KLAPHAKE (Thomas Andrews) brings a broad range of credits to his role as leader and founder of the Arizona Broadway Theatre, having laid the plans for this modern theatre enterprise. In 2015, Kiel was named Nonprofit Leader of the Year by Leadership West; additional accomplishments include being named one of the West Valley 24 by West Valley Magazine, Phoenix Business Journal’s Forty-Under-40, a graduate of Leadership West and a former member of both the National Alliance of Musical Theatre and the National Dinner Theatre Association. As the CEO/Executive Producer for ABT, Kiel has elevated the company to being the largest musical theatre producer in the state receiving numerous awards and accolades including Westmarc’s Best of the West Award, Phoenix Magazine’s Best Playhouse, and recently Business Partner of the Year from the Peoria Chamber of Commerce. Artistically, Kiel has worn many hats at ABT, including that of conductor for Brigadoon and director of numerous productions, including: Cabaret, Gypsy, Lend Me a Tenor, 42nd Street, The Drowsy Chaperone, The Full Monty, Sunset Boulevard, Oklahoma!, Disney’s The Little Mermaid and West Side Story. As a performer, Kiel shared his talent on stage in Annie Get Your Gun, Phantom, Peter Pan and most recently as Valjean in Les Misérables. Additionally Kiel spent several years in the role of Raoul in the original Hal Prince production of The Phantom of the Opera in Hamburg, Germany. A native of Missoula, Montana, Kiel earned his bachelor’s degree in music from The University of Montana and a Master of Music degree from The New England Conservatory in Boston, Massachusetts. KIERAN KLAPHAKE (Bellboy), a freshman at Sandra Day O’Connor High School, is thrilled to return to the ABT stage! He performed most recently as Charley Bates in Oliver! and Scut Farkus in A Christmas Story. Kieran made his ABT debut at the age of nine in Joseph…Dreamcoat and has literally grown up on this stage, playing such great roles as Flounder in Disney’s The Little Mermaid, Louis in The King and I, and flying through Neverland as John Darling in Disney’s Peter Pan. ABT Academy shows include Panik at the Disco, Shrek, Jr., Squirm!, Disney’s The Jungle Book and Disney’s 101 Dalmatians. Kieran is also a proud member of ABT’s performance troupe, HyRev. In addition to singing, he enjoys playing piano, songwriting, photography, sketching, and hanging out with his three-legged rescue dog, Django. Thanks to Mom, Dad, and Tristan for believing in me. JOHN KNISPEL (Frederick Barrett) is so humbled to be returning to Arizona Broadway Theatre for his 2nd season! After performing in Man of La Mancha, A Christmas Carol, Show Boat, and Hair last season, he knew he\’92d have to do what he could to come back to this winter paradise! Favorite past credits include Emcee in Cabaret, Elvis Presley in Million Dollar Quartet, Ritchie Valens in Buddy: The Buddy Holly Story, Lord Farquaad in Shrek: The Musical, and Princeton in Avenue Q. A Billings, Montana, native, John graduated from the University of Montana with degrees in Vocal Performance and Music Education. John would like to give a huge thank you to his family, Paul, Berta, Jessica, and Anica, for being so supportive over the years. CAROLYN McPHEE (Ida Strauss) is excited to step aboard this amazing production! Carolyn has been kept busy by ABT, most recently in the Encore Room’s premiere production of Forbidden Broadway. Recent ABT favorites include Catch Me If You Can (Paula), Bridges of Madison County (Marge), Hands on a Hardbody (Virginia), A Christmas Story (Mother), and The Great American Trailer Park Musical (Linoleum). Originally from Chicago, Carolyn attended NIU and appeared in theatres throughout Chicago including Drury Lane, Apollo Theatre, Apple Tree, Theatre at The Center, Light Opera Works, Borealis and Pheasant Run Dinner Theatre. Carolyn and her husband foster kittens and help rehome found pets. Carolyn donates her entire salary to help with spay/neuter/dental costs of cats and dogs for people who cannot afford it. ANDY MEYERS (Harold Bride/ Wallace Hartley) is thrilled to be returning to ABT where he has most recently appeared as Bud in The Bridges of Madison County, Sancho in Man of La Mancha, Jean Shepherd (Narrator) in Christmas Story, Enoch Snow in Carousel and King Herod in Jesus Christ Superstar, as well as directing South Pacific, The King and I, Oliver, The Best Little Whorehouse in Texas, The Secret Garden and Seven Brides for Seven Brothers, among many others. He is currently in his 8th year as Artistic Director of Fort Peck Summer Theatre, where he had led the company to recording breaking seasons, and was previously Managing Director for Performing Arts at Snug Harbor Cultural Center, Staten Island, NY. Other favorite performance credits include the national tours of Annie and Bus Stop. Andy is a graduate of Walnut Hill School for the Arts in Boston, Wagner College in NYC and holds his Masters from University of Montana. TYLER PIRRUNG (Benjamin Guggenheim) is so happy to be returning to ABT for his fifth show! He holds his BA in Theatre from Florida State University. Tyler was previously seen on the ABT stage as Frank Schultz in Show Boat and also in the ensembles of Funny Girl and Oliver! Other recent credits include Singin’ in the Rain (Cosmo Brown), Young Frankenstein (Igor), The Drowsy Chaperone (Aldolpho), and A Christmas Carol (Christmas Past). He would like to thank his family, Charlie, and his friends for their endless love and support and also Kiel, Cass, and Kurtis for bringing him back out West! To see what else Tyler has done and to find out what adventures await him next, visit www.tylerpirrung.com! JAY ROBERTS (Edgar Beane) is incredibly excited to be back in Arizona! Previously at ABT he was seen as Old Joe in A Christmas Carol, Mr. Sowerberry in Oliver, and Schroeder in Charlie Brown Christmas. Jay is finally applying his degree in architecture, designing a historical wing for the Pioneer Museum in Glasgow, Montana, and has been scenic designer for several shows at Fort Peck Summer Theatre. A few of his previous roles include Arthur Kipps in The Woman in Black, the Jeff Barry in Leader of the Pack, and Prince Eric in Disney’s the Little Mermaid at the Fort Peck Summer Theatre. Jay is overjoyed to be returning to the ABT family. Thank you to Cass and Kurtis for this amazing opportunity. MEGGIE SIEGRIST (Marion Thayer) couldn’t be happier to be back on her favorite stage in Arizona! She was last seen on the Herberger stage as The Beggar Woman in ABT’s production of Sweeney Todd. Other credits include Hair (ABT), Ursula in The Little Mermaid (Fort Peck Summer Theater), Mrs. Banks in Mary Poppins (Jenny Wiley Theater), The Housekeeper in Man Of La Mancha (ABT), Ellie Greenwich in Leader of the Pack (Fort Peck Summer Theater), and Audrey in Leading Ladies (The Great American Melodrama). She would like to give a huge shout out to her entire ABT family for making Arizona the best home away from home a girl could ask for. JILL TIESKOETTER (Alice Beane) is very excited to be back at ABT after reprising the role of Mrs Cratchit/Scrooge’s Mother in the ABT production of A Christmas Carol at the Herberger Theater Center. Jill was welcomed into the ABT family in 2006 and has been returning from Alaska ever since. You may remember her as Anna in The King and I. Jill is the proud mother of two Huskies, Quigley and Guinness. She would like to thank her hubby, Rob, for his support in pursuing her passions and you for being here to support live theatre. Enjoy the show! ERIC WATERS (Charles Clarke) is ecstatic to be returning to Arizona Broadway Theatre after joining the “practically perfect” cast of Disney’s Mary Poppins last summer! A Texas native now based in New York, Eric is a proud graduate of the Coastal Carolina University BFA Musical Theatre Program. Selected Regional: White Christmas (Prather Productions, PA), South Pacific (The Fireside Theatre), Spamalot and Damn Yankees (Sharon Playhouse, CT), 9 to 5, Young Frankenstein, and Kiss me, Kate (Weathervane Theatre, NH). Special thanks to everyone at Arizona Broadway Theatre. Enjoy the show! BRODY WURR (Bellboy) is thrilled to be part of this amazing production of Titanic The Musical! Brody most recently was seen in Arizona Broadway Theatre at the Herberger Theater Center’s beautiful and haunting Sweeney Todd. Favorite roles include The Artful Dodger in Oliver! at Arizona Broadway Theatre, Herman in Cabaret at Spotlight Youth Theatre, and Archie in 13 The Musical at Musical Theatre of Anthem (NYA award and ariZoni nomination). Brody is the proud recipient of the 2016 National Youth Arts Award for Junior Artist of the Year. Thank you to everyone at ABT for making dreams come true! LIANE ZIELINSKI (Kate Mullins) is thrilled to be returning to the Arizona Broadway Theater! Previous ABT credits include Sweeney Todd (Ensemble/ Beggar Woman cover) and Hair (Tribe Member). Most recently, Liane was seen in the Forestburgh Playhouse’s Steel Magnolias (Annelle). Other credits include FBP’s Baskerville (Actress 1), Rocky Horror Show (Columbia), Young Frankenstein (Elizabeth Benning) and To Kill A Mocking Bird (Jean Louise), The Theater Barn’s productions of Nunsense (Sister Mary Amnesia), Godspell (Day by Day Soloist), and Guys and Dolls (Hot Box Dancer / Adelaide u/s). Proud graduate of Marymount Manhattan College. Thank you to my incredible family for your never-ending love and support! JOSEPH DePIETRO (Matthew), a native New Yorker, is excited to be back at Arizona Broadway Theatre and living his 90s boy band dreams. Joseph was just at ABT this spring playing Woof in Hair and has also played Young Scrooge in A Christmas Carol. Other favorite credits include Ragtime, Jack in Into the Woods, Rutledge in 1776, and Henrik in A Little Night Music. Joseph has also sailed around the world as a Production Singer aboard the Queen Mary 2. Many thanks and love to the Core 4, this wonderful ABT family, and the best friends in the world. JOE OGREN (Mark) is thrilled to return to ABT after playing Stacee Jaxx in 2016’s Rock of Ages! Joe spent the first half of his summer in Logan, Utah, playing Dickon in The Secret Garden and the title role in You’re a Good Man, Charlie Brown with Utah Festival Opera. Other favorite regional credits include Willard in Footloose, Crutchie in Disney’s Newsies, and Max in the US regional premiere of Lend Me a Tenor: The Musical. In 2015, Joe joined the national tour of the Tony Award-winning musical Memphis where he covered the lead role of Huey Calhoun. Originally from California, Joe now resides in New York City where he earned his BFA from Pace University. As always, love and gratitude to Mom and Dad! Follow his journey @joeogren and enjoy the show! KIRK SOBJECT (Juan) Arizona Broadway debut! From Japan, to Germany, to Russia, to NYC and now Peoria! Kirk has performed all over the world and is thrilled to land here with you tonight. See you in La Vida Eternal! SAM PRIMACK (Abraham) is beyond excited to be involved with Altar Boyz! He is a National High School Musical Theatre Award finalist and a junior at Chaparral High School. Past shows include Pugsley Addams in the national tour of The Addams Family, Moritz in Spring Awakening (ariZoni Award) at SYT, and Friedrich in The Sound of Music at ABT. Sam would like to thank everyone at ABT for their continued support over the years. Finally, he would like to thank his family for being the most supportive people in the world. DEMI AHLERT (Ensemble) is thrilled to be making her Arizona debut with such a fabulous show! BFA Musical Theatre, Point Park University. National Tours: Pippin (Fastrada), Phineas & Ferb The Best Live Tour Ever! (Candace); Regional: Beauty & the Beast (Babette), The Pajama Game (Gladys), Nice Work if You Can Get it (Jeannie). She’d like to thank the creative team for this incredible opportunity and her mother for all her love and support! LAUREN ALAGNA (Ensemble) A Florida native, Lauren is thrilled to be a part of Catch Me If You Can at Arizona Broadway Theatre. Performance experience includes Crazy for You (Polly Baker), Mamma Mia (Lisa), Tarzan (Ensemble/Aerialist), Regent Seven Seas Cruises (Singer/Dancer), and a dancer for the opening number of Gypsy of the Year (Dir. Al Blackstone). Lauren thanks her family and friends for their love and support. AMY BURGMAIER (Carol Strong) is thrilled to make her ABT debut, breathing life into this extraordinary true story once again! She has dazzled audiences in Catch Me If You Can (1st national tour, Carol Strong), Annie (national tour, Pugh & Hannigan U/S), Legally Blonde (Paulette), Hairspray (FAF), Honky Tonk Angels (Angela), Forbidden Broadway (12 mezzo roles), Reefer Madness (Mary Lane), Chicago (Roxie Hart), and A New Brain (Nurse Nancy). Amy holds degrees in Advertising & Design Studies (BA) and Journalism (MS) from Iowa State University and offers her sincerest gratitude to Luigi’s Jazz Center, Amanda Flynn Voice Studio, Guy Stroman, Mom, Dad, Lori, Cole, and Allyson! CHRISTOPHER CODY COOLEY (Todd Branton) is excited to back at ABT! He was last seen in Show Boat. He holds a BA in Acting from Rider University: Westminster College of the Arts. Past credits: Show Boat, Grease (Prather Productions) Crazy For You, Mamma Mia (Post Playhouse), Shrek The Musical, 42nd Street, The Fantasticks (Forestburgh Playhouse); Cole (St. Vincent Summer Theatre), The Wizard of Oz, White Christmas (Toby’s Dinner Theatre), Our Town, Metamorphoses (Rider University). Love to friends and family for their support! DAVID COUTER (Ensemble) Previous credits include Edmund in The Lion, the Witch and the Wardrobe (Theatreworks USA), Lucius/Demetrius in Titus Andronicus (Rose Playhouse Bankside), Peter in Comfort (Lincoln Center), Stuff in Sweet Bird of Youth (Gallery Players), Cassio in Othello (TheaterLab), and Dan in A Tree, a Dog, and an Ordinary Man (WorkShop Theater). He received a BFA in Theatre from the University of Memphis. For Kelly. Smile. Skip. Laugh. CAELAN CREASER (Ensemble) is thrilled to be making her ABT debut! Originally from Seattle, Caelan is currently studying BM Musical Theatre at ASU. Recent Credits: Newsies at Phoenix Theatre (Female Ensemble), Thoroughly Modern Millie at Hale Centre Theatre (Millie, AriZoni 2017 Winner), Legally Blonde at ASU (Elle Woods), Mary Poppins at Tacoma Musical Playhouse (Mary Poppins), Jekyll & Hyde at At the Ridge Theatre (Lucy Harris), and South Pacific at Seattle Musical Theatre (Ensign Janet MacGregor). Love and thanks to this amazing cast, crew, and creative team, her family, and Matt! Check out www.caelancreaser.com for more! OLIN DAVIDSON (Johnny Dollar) is thrilled to be making his Arizona Broadway debut. Credits include My Fair Lady (Henry Higgins), Mary Poppins (Bert), Beauty and the Beast (Lumiere), The Little Mermaid (Scuttle), Oklahoma (Will Parker), Cats (Skimbleshanks), Mamma Mia (Harry), Forever Plaid (Smudge). He has also performed with Debbie Gibson as a backup dancer and Barry Manilow as a vocalist. Many thanks to my loving family for their never-ending love and support, as well as the team here at Arizona Broadway for this opportunity and for ‘Catching Me When They Did’. JAMES Du CHATEAU (Ensemble) started his career with the Radio City Christmas Spectacular in Nashville, Tenn. He made his Broadway debut in How the Grinch Stole Christmas as Danny Who. Recent credits: Assistant Dance Captain, Saturday Night Fever; Dancer, Grand Celebration Cruise; Hanna, La Cage Aux Folles; Tommy Djilas, The Music Man; Ensemble, Mamma Mia; Ensemble, 42nd Street. James is excited to perform here at ABT! STEPHEN C. KALLAS (Ensemble) is a graduate of Wagner College with a double concentration in Performance and Technical Studies. Regional Credits: Fireside Theatre Newsies (Davey); Palace Theatre (N.H.) 42nd Street (Ensemble/Mac u/s); Mac-Haydn Summer 2017; In the Wings Productions’ 42nd Street (Andy Lee); Interlakes Summer Theatre 2016; Select WCT credits: Titanic (Edgar Beane), Avenue Q (Puppeteer/Swing), Anything Goes (Sailor Quartet) & CATS (Swing-Mungojerrie/Macavity). Thank you to the Arizona Broadway Family! More at www.StephenCKallas.com. CAROLYN McPHEE (Paula) is thrilled be part of this groovy cast and to be reunited with her A Christmas Story Director, Stephen Casey! Carolyn just finished directing Alice in Wonderland and playing Marge in the amazing AZ Premiere of The Bridges of Madison County right here at ABT. Carolyn has been on the ABT stage off and on since Season 1 and favorites include Hands on a Hardbody (Virginia), A Christmas Story (Mother), The Great American Trailer Park Musical (Linoleum), and 9 to 5 The Musical (Violet). Carolyn has been lucky enough to work for Jeff Kennedy & iTheatre for five Christmases at The Herberger, and Smokey Joe’s Café at Phoenix Theatre (AriZoni Nomination). Originally from Chicago, Carolyn attended NIU and appeared throughout Chicago. Carolyn and her husband foster kittens and help rehome found pets. Carolyn donates her entire salary to help with spay/neuter/dental costs of cats and dogs for people who cannot afford it. LAUREN MORGAN (Ensemble) is delighted to return to ABT for her tenth production. Favorites include Rock of Ages, Hairspray, The Producers, White Christmas, and Saturday Night Fever. She hails originally from Dayton, Ohio, and had a BFA in Dance from Wright State University. Endless gratitude to Cass, Kiel, and Kurtis for their continued support. She sends love to her family for their encouragement in fulfilling her dreams. MEGAN K. MOYLAN (Brenda Strong) is thrilled to be returning to Arizona Broadway Theatre. Recently, she was seen as Megan in Godspell (Phoenix Theatre), Amy in Rock the Presidents (Childsplay, National Tour), and Lizzie in Lizzie (A/CTC). Other roles include Kirsten/Kit/Felicity/Nellie in The American Girl Revue (Mattel, Los Angeles), and Jane in The Prince and the Pauper (Deaf West). Film/television experience includes iCarly (Nickelodeon), Commander-in-Chief (ABC), and Ninja Cheerleaders (NCS Productions), as well as multiple commercials, radio spots, and original cast recordings. Megan would like to thank everyone involved with Catch Me If You Can for all their invaluable support. SAL PAVIA (Frank Abagnale, Jr.) is so happy to return to the Arizona Broadway Stage after last being seen as Link Larkin in their 2013 Season’s production of Hairspray. Sal’s from New York City and is a graduate of Wagner College where he earned a BA in Theatre Performance. Credits include Off Bway: My Big Gay Italian Wedding/Funeral. National Tours: Legally Blonde (Emmett), Brigadoon (Charlie). Regional: Bonnie and Clyde (Clyde), A Chorus Line (Al), Rock of Ages (Stacee Jaxx). Thanks to his amazing wife Kaitlyn, parents, and Danny at Hudson Artists for being the best support team a guy could ask for. Congrats to the entire ABT team – now let’s fly! JASON PLOURDE (Frank, Sr.) is thrilled to be returning to Arizona Broadway Theatre for his fourth production. A versatile and seasoned performer, Plourde has 20 years’ experience in opera, theatre, and musical theatre. Some favorite credits have included Dr. Jekyll and Mr. Hyde (Jekyll and Hyde), Henry Higgins (My Fair Lady), Dr. Craven (The Secret Garden), Padre (Man of La Mancha), The Husband (Putting it Together), Tom (The Norman Conquests), Tony Wendice (Dial M for Murder), and Eddie (Lost in Yonkers). For upcoming performances, videos and all things #JasonPlourdeSuperstar, visit www.jasonplourde.net. SAMANTHA ROSS (Ensemble) is extremely thankful to be performing here at Arizona Broadway Theater. She is a recent graduate of Wagner College with a BA in Theatre performance and a minor in dance. She was last seen in The Hip Hop Nutcracker in Washington DC. Some of her favorite past roles include Virtue from Anything Goes and Hedy from How to Succeed in Business Without Really Trying. Samantha would like to send a special thanks to the entire company and crew and to her family. ROB WATSON (Roger Strong) is ready to “pass a good time” with this high-flying show. A University of Dayton graduate with degrees in Theatre and Religious Studies, Rob normally remains behind the scenes as ABT’s Company Manager. Previous credits include The Bridges of Madison County (Charlie), Hands on a Hardbody (Don Curtis/Dr. Stokes), Rock of Ages (Dennis), Annie Get Your Gun (Frank Butler), Sound of Music (Georg von Trapp), The Music Man (Harold Hill), Brigadoon (Jeff Douglas – ariZoni nomination), Pump Boys and Dinettes (Jim), The Secret Garden (Neville Craven), The Fantasticks (El Gallo), and City of Angels (Stone). Rob loves working in all aspects of the theatre and would like to thank Cassandra, Kiel, and Kurtis for affording him this opportunity, and he promises to get all his other work done. His favorite time of day is 5:37! KATHLEEN BERGER (Miss Andrew/Mrs. Corry) is thrilled to return to AZ Broadway! Recently: Eulalie McKechnie Shinn (The Music Man/Showtune Productions); Soprano Soloist: Requiem (Michael Haydn/Glendale College); Soprano Soloist: Mass in C (Beethoven/Helios Ensemble); What Makes it Great: Gershwin (Robert Kapilow/MIM); Narrator (Joseph…Dreamcoat)/FHTAZ); Love is Here to Stay (Theater Works); Beggar Woman (Sweeney Todd/MET – Best Supporting Actress); Nettie Fowler (Carousel/AZ Broadway); Yvonne/Naomi (Sunday in the Park With George/FHTAZ); Queen (SpellBound!/Southwest Shakespeare, premiere); Soprano Soloist: Vesperae Solennes de Confessore (Mozart/Glendale College); Solange (Follies/Theater Works, AZ premiere); Soprano Soloist: Requiem (Mozart/Glendale College); Miss Jones (H2$/Theater Works, AriZoni nomination); Rose (The Secret Garden/AZ Broadway). Internationally: Violetta (La traviata); Musetta (La bohème); Lucia (Lucia di Lammermoor); Countess Almaviva (Le nozze di Figaro); Witch (Into the Woods), many more. She is the only American singer to ever appear with Compañía Lírica Dolores Marco in Spain. I love and could not do this without my SuperManuel, my tiny twin Alba-Bergers, my family, and the Four Kitties of the Apocalypse! ALLISON BLANCHARD (Annie) is a Franklin, Tennessee, native and holds a BFA in modern dance from the University of South Florida. Her recent credits include: 42nd Street National Tour; Scrooge No More, Busch Gardens Williamsburg. She is very excited to be spending her summer with Arizona Broadway Theatre performing in Mary Poppins! WYATT CHAMOFF (Michael Banks) is thrilled to be making his ABT debut with Mary Poppins! Wyatt is 9 years old and will start 4th grade in the fall. Wyatt has previously appeared in Flat Stanley, Beauty and the Beast as Chip, Shrek the Musical, and most recently in Charlotte’s Web as Templeton the Rat. Wyatt enjoys to reading, playing with his sister, and asking questions. He would like to thank his family for all they do to support him. CHAE CLEARWOOD (Mrs. Brill/Bird Woman) is thrilled to be making her ABT debut this season! Her favorite credits include Dyanne in Million Dollar Quartet, Adelaide in Guys and Dolls, Rizzo in Grease, and Dolly in One Man, Two Guvnors. A native of Billings, Montana, Chae now resides in New York City where she recently graduated from the American Musical and Dramatic Academy. She also holds a BA in Theatre Arts from Montana State University – Billings. Chae would like to thank the numerous friends and family who have supported her dreams and ambitions over the years, without which none of this would be possible. JULIANNE CREED (Jane Banks) just finished 6th grade. She loves to perform and is thrilled to be in her first role with ABT! Her past performances include Young Fiona in NCS’s production of Shrek, Jr., Young Wilbur in Charlotte’s Web, and Gracie Shinn in The Music Man. She has also performed as Cinderella in Cinderella, and as part of the Ensemble in White Christmas for Pinnacle Creative Arts. She loves doing gymnastics, being with her family and friends, singing, and just being creative however possible! BEATRICE CROSBIE (Mrs. Winifred Banks) is overjoyed to join Arizona Broadway Theatre this summer! NYC based, UCLA alumni. Tours: Beauty and the Beast International (Wardrobe/Mrs Potts us), 42nd Street National (Diane/Dorothy Brock us), How the Grinch Stole Christmas, the Musical National (Grandma Who) Regional: Nice Work If You Can Get It (Billie), She Loves Me (Amalia), Company (Jenny) Big thanks to the ABT team and Luedtke Agency. Love to my incredible family! ALEX CROSSLAND (Ensemble) is very happy to be returning to Arizona Broadway Theatre, he holds a Bachelors of Music in Musical Theatre Performance from Arizona State University, but is originally from Northern California. Recent regional credits include Gypsy (Farmer’s Alley Theatre) Newsies and The Hunchback of Notre Dame (The Barn Theatre), and Million Dollar Quartet, Billy Elliot, and Bullets Over Broadway (Phoenix Theatre). Some of his favorite roles include Ralph in Reefer Madness, Henry in Next to Normal, Grantaire in Les Miserables, and Roger in Rent. Alex would like to thank his friends and family for their support. EVAN DOLAN (Ensemble) is supercalifragilistically excited to return to Arizona Broadway in Disney’s Mary Poppins! Some of his favorite credits include the Jeff Award-winning production of Sweeney Todd (Paramount Theatre), Funny Girl (Arizona Broadway), Cabaret (Thingamajig Theatre Co.), West Side Story (Woodstock Playhouse), and Nice Work If You Can Get It (Broward Stage Door). He sends a massive “THANK YOU” to his family for supporting him in all of his adventures, and to Clayton and everyone at ABT for their continued generosity! SAMANTHA GARDNER (Ensemble) is thrilled to make her debut at the Arizona Broadway Theatre, and return to one of her favorite shows, “Mary Poppins.” Previous credits include: “Gershwin” (Off-Broadway), “Happy Days” (Westchester Broadway Theatre), “Show Boat” Magnolia u/s (Alhambra Theatre & Dining), and Ms. Lark “Mary Poppins” (Prather Entertainment Group). Love always to Mom, Dad, Marshall, Alex, and Snow. Enjoy the show! PHILLIP GIANDILETTI (Neleus) is a recent graduate of Oklahoma City University and is excited to be making his first appearance at Arizona Broadway Theatre in Mary Poppins. He has recently finished performing in Dallas at Casa Mañana Theatre in Evita, Al Deluca in A Chorus Line at Uptown Players, and in Grease as Danny Zuko at Firehouse Theatre. Other theatre credits include: Thoroughly Modern Millie (Ensemble), Newsies (Oscar Delancey/Ensemble/Dance Captain), 7 Brides for 7 Brothers (Nathan); Music Theatre Wichita. West Side Story (Anxious); Lyric Theatre of Oklahoma. Mary Poppins, 42nd St. (Ensemble); The Lexington Theatre Company. STEPHEN HOHENDORF (Policeman) is ecstatic to be returning to this beautiful theatre and for such a magical show! Previous ABT credits include Mordred in last season’s Camelot, Fiddler on the Roof, and The Best Little Whorehouse in TX. Stephen is coming straight from a run of Show Boat (Frank Schultz) at the Dutch Apple Dinner Theatre in Lancaster, PA. National Tours: The Full Monty, Sesame Street Live!, Pinkalicious, and Flight School the Musical. New York: Stinky Kids, Pinkalicious, the Scarecrow in The Wizard of Oz (Vital Theatre Company), and Leaf in The 25th Annual…Spelling Bee (MCTC). Regional/ Summerstock: Surflight Theatre, Hope Summer Repertory, and The Liberty Theatre. Stephen spent his last two summers at the historical Ft. Peck Summer Theatre directing, choreographing, and acting in shows such as Oliver!, Arsenic and Old Lace, Mary Poppins, and Grease. A humongous thank you to the amazing team here at ABT- Cass, Keil, Kurtis, and Clayton! And a big thank-you to YOU for continuing to support live theatre. CONNOR HUBBARD (Park Keeper/Northbrook/Valentine/Bert cover) is absolutely stoked to be making his ABT debut! Recent favorites include Monty Python’s Spamalot, Anything Goes, Hello Dolly!, Saturday Night Fever and Nice Work If You Can Get It. Major love and gratitude to family and friends that have supported me along the way — you’re the best. AARON McCASKILL (Michael Banks) is 11yrs old and in 7th grade. He is home-schooled and enjoys playing the piano, dancing, cooking and reading. Aaron has performed throughout the valley including at Valley Youth Theater in A Winnie the Pooh Christmas Tale (Piglet). His other productions include Madagascar (Foosa) at Queen Creek Performing Arts; Robin Hood and His Merry Men (Kevin), All Shook Up (Dennis), and Thoroughly Modern Millie Jr. (Ching Ho), all at Actors Youth Theater. Aaron loves being on stage and is excited to be a part of Mary Poppins at ABT. GRACIE PALMER (Jane Banks) Gracie’s first love is acting – anywhere, anyhow. She was last seen playing the spunky Vivian in Starlight Community Theater’s presentation of Revenge of the Space Pandas as an acrobatic equestrian circus performer – Cornelia – at Pinnacle Creative Arts, and the energetic, acrobatic, Unicorn in Lion the Witch and the Wardrobe at Theaterworks. When not performing on the theatrical stage, Gracie studies all forms of dance, practices Kung Fu and takes piano, singing, and acting lessons and sings in her church choir. Gracie loves school – especially writing (fiction), participates in advanced mathematics programs, and loves to play at the park with her siblings and friends. JAMIE PARNELL (Mr. George Banks) a native of Montana, is delighted to be spending the winter once more with ABT. Jamie, who studied voice performance and has a BA in Theatre from the University of Montana, performed for the first time on the ABT stage in the 2009 production of A Christmas Carol as Young Marley. Since then he has been lucky enough to work with them in Phantom, Footloose, and as Vittorio Vidal in Sweet Charity. Having spent Season 12 in ABT productions of Funny Girl (Nick Arnstein), Camelot (Lancelot), Oliver!, and Jesus Christ Superstar, Jamie is looking forward to a shift in gears and to helping to bring this classic show to Phoenix audiences. KARA ZIRINGER (Ensemble/Mary Poppins cover) is thrilled to be returning to the ABT stage! She graduated from the Florida State University in May of 2016 and has been living in New York City ever since. Her previous ABT credits include Showboat (Ensemble/Magnolia Cover) and A Christmas Carol (Ensemble) at the Herberger Theatre Center! Other favorite credits include: A Chorus Line (Maggie), Into the Woods (Rapunzel), Legally Blonde (Serena), and Young Frankenstein (Dance Captain/Ensemble). She would like to thank her family and friends for their unwavering love and support. Enjoy the show!